Once again – for the 24th time – a mass climate conference with over 20,000 participants (400 of them from Guinea alone) has come to an end and the politicians and climate officials involved praised its success: “Once again the earth was saved”. It’s all actually quite simple: you only need to reduce CO2 emissions and global temperature drops. Reductions have been decided at every conference for 24 years – and emissions have always risen the following year, and done so for 24 years now. But nobody is interested in the fact that despite this, there has hardly been a global rise in temperature in 16 years (since 2002) and record emissions of 500 billion tons of CO2 in this period. 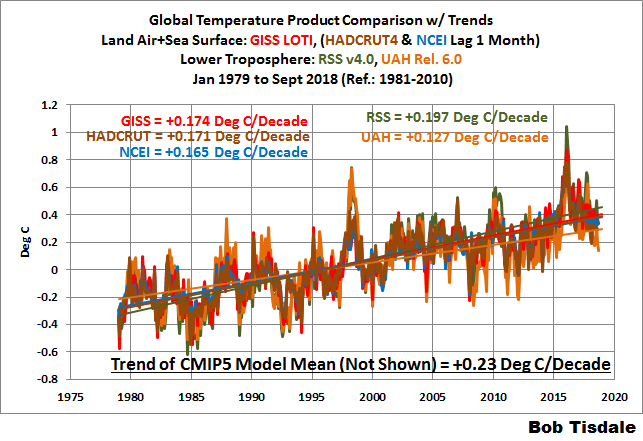 Instead there has been a strongly decelerated warming, sometimes even called a “hiatus”. But acknowledging this would possibly jeopardize next year’s planned climate conference. There are 5 respected climate institutes dedicated to professional global temperature monitoring. Two of them are based on satellite data and three on ground measurements. The data series naturally show slight differences, but the same trend for 40 years. You can probably see an increase of 0.1 to 0.2 ° C over the last 16 years (since 2002) – my, what a huge climate change! (without misusing the peaks of 1998 and 2015/16 as an effect of the El Nino in the Pacific, which have nothing to do with the climate trend as such). Without a doubt there was a global temperature increase of around 0.4°C between 1975 and 2002, but also a drop in temperature of around 0.2°C between 1940 and 1975 (despite the increase in CO2 emissions – unbelievable what Nature can do!). This was ignored when the CO2 hypothesis emerged in the 1980s because of the correlation between temperature increase and CO2 increase. But (intermittent) correlation does not mean causality. There was no criticism of this simplistic and naive CO2 hypothesis because no climatologist wanted to forego the resulting public and political attention. For journalists it became a favorite subject in which CO2 was declared “pollution, pollutants or even ‘climate killer” with an accompanying subsequent doomsday. Anyone with just even some experience in organization and management knows that the outcome of a conference is inversely proportional to the number of participants. Thus, a climate conference with 20,000 participants and two weeks duration is doomed from the start. Can anyone name another area where a problem has ever been solved by a mass conference? Only an effective conference with a small number of participants would have a chance of success, as has happened in other cases. But today no climate functionary nor climate politician wants to do without the annual climate party, which is staged with much publicity and each time at a different place of interest — generally done at the expense of the taxpayer. The least problematic about each conference is the decision on the time and place for the next climate conference. You would think, the alarmist crowd would use their ample resources to avoid CO2-emitting mega events, utilising and even innovating online-capabilities instead. But the hordes of believers are overwhelming, their self-reenforicng “credo” (“I believe”) is an unstoppable impetus in its own right. They are beyond the discipline of facts, having lost their capacity for rational self-control. I like the quote from the Bamberg sociology professor – however, I do not like the fact that no source is given by Kalte Sonne. One of the many things I like about NoTricksZone is the accuracy with which sources are quoted. Thanks for the excellent translation. Except this time; After Brazil refused to host next year’s giga-show, has any volunteer come forward? Somebody mentioned Chile but I can’t confirm that. I nominate Venezuela, so the elitist scam artists can see what damage socialist policies like theirs can and do cause. Rub their faces in it, I say. The alarmists claim that each year is hotter than the last. Ask them to show the global average temperature for those years so we can ensure we’re on track to preventing a rise above some unknown pre industrial average global average temperature and they become mute. They go blank. They don’t know what today’s global average temperature is, what the pre industrial one was, but they do want to prevent temperatures rising 1.5°C above it. So then they say it’s not the global average temperature that’s important, it’s the anomalies from a baseline that are important. Thing is, we’re not trying to limit warming to a rise of 1.5°C above anomalies. We are supposedly trying to limit it to a rise above the pre industrial temperature. It’s utter nonsense when you think about it. They know it too. The temperature hasn’t played ball, so now they’re wailing about a broken climate. This “broken climate” apparently has come about having been caused by global warming. Ask them about global warming and you’re back to square one. Given that the UN-IPCC suppose that 1.5°C of warming sometime in the future (when? )would herald a disaster for the planet, what is the correct temperature for this planet now? And that naturally leads to — thus define the proper rate of warming (x°C/century) we should encounter while exiting the last LIA. Currently this planet has run at about 1°C/century since 1850, not exactly alarming nor unnatural.